P-814 FOR SALE: A beautiful model in 1/72 scale made in Russia. Top quality workmanship. Price $400, buyer pays actual postage costs from Vancouver, Canada. 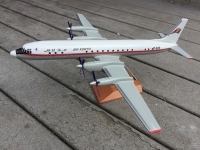 P-632 FOR SALE: Air Koryo Tupolev Tu-204-300 P-632 1/100 mint condition, this model is hand painted and made in Russian. P-835 Air Koryo IL-18 1/72 mint condition. Model is made in Russia.